Elijah's faithful prayers received stupendous, powerful answers from God! Do yours? Here's how they can. Prayer is many things to many people in this world — a silent moment of meditation, an occasional blessing on a meal, a "thought for the day," a few words from a clergyman at some public event or a raving, emotional torrent that pours forth from a sweating tent evangelist. But not so for God's people! Our glorious, merciful God has shown us the what, why and how of prayer. He has revealed the mechanics of prayer and the awesome, supernatural results available through prayer. God's Word is filled with powerful examples of how God answered the prayers of His people. Abraham prayed for Abimelech and God healed Abimelech's family and servants (Gen. 20:17- 18). Moses moved God to change His mind about destroying ancient Israel (Ex. 32:9-14). David stayed close to God through prayer and was made king over God's people (I Sam. 13:13-14, 15:28, 16:11-13). Daniel prayed himself from a human "lion's den" into a real one, and then prayed himself out (Dan. 6:4-5, 10, 23). Daniel's three young associates, Shadrach, Meshach and Abed-Nego, prayed to God and were delivered after being cast into a fiery furnace heated seven times hotter than the manufacturer's instructions said to heat it! God, for their troubles, even joined them inside the furnace (Dan. 3:14-30). All these are remarkable examples of believing prayer! Yet the apostle James, in James 5:16-18, highlights one specific example of prayer especially for our benefit today — for us who are helping fulfill the end-time commission of Elijah (Mal. 4:5-6). It is the example of Elijah himself! The story of Elijah's believing, heartfelt prayer should take on much deeper meaning for us in these last days. God prophesied of three "Elijahs." The first was the man Elijah, who was the pattern or type of the two following. John the Baptist was the second "Elijah" (Matt. 17:12-13). And in this end time, Herbert W. Armstrong supported by God's true Church is fulfilling God's commission as the third "Elijah" (Mal. 4:5-6, Matt. 17:11). Let's look at the powerful role prayer played in the life of the original Elijah. James capsulized the original Elijah's example in James 5:16-18: "The effective, fervent prayer of a righteous man avails much. Elijah was a man with a nature like ours, and he prayed earnestly that it would not rain; and it did not rain on the land for three years and six months. And he prayed again, and the heaven gave ram...."
At first glance, we could miss the significance of this shortened account and move on. That would be unfortunate, because when we refer to this dynamic Old Testament example, we see more deeply the importance of what James synthesized for us. Let's watch Elijah's tremendous story unfold. Would it be possible for God to perform 14 separate miracles in your life, one after the other, and still have you act as if you never knew the Almighty? That's what Elijah did. Oh yes, he did! Why? This is an important point to remember: God wants us to know that the word mighty is not spelled, so to speak, f-l-e-s-h, but H-o-l-y S-p-i-r-i-t (II Cor. 10:4)! Elijah needed sleep, food, shelter and clothing, just as we do today. The statement of James 5:16-18 is set against the backdrop of normal human frailty. No longer can we excuse ourselves from expecting mighty results through believing prayer. Elijah was no more superhuman than any of us and he received such results. Here's how. 1) Elijah proclaimed to King Ahab 3 1/2 years of drought. It came to pass (I Kings 17:1). 2) Elijah was sustained on bread and flesh by ravens (verses 2-6). 3) God sustained Elijah and the widow and her son on meal and oil (verses 8-16). 4) After Elijah prayed about the widow's deceased son, God revived the boy (verses 17-24). Now for an interlude. King Ahab instructed his house governor, Obadiah, to search with him for this elusive Elijah. The king wanted relief from the devastating drought. This helped set the stage for God, through Elijah, to turn the people's hearts back to God (I Kings 18:1-29). 5) God glorified Himself, after a short prayer from Elijah, by consuming with fire the burnt sacrifice, the wood, the stones, the dust and the water 10 the trench. Elijah took advantage of the situation by instructing the repentant Israelites to help him slay 850 pagan prophets. This they did (verses 30-40). 6) This miracle is the other one James mentions in lames 5:16- 18. Elijah prayed again, and the rains came. What an incredible sight that must have been (I Kings 18:41-45). And what a desperate need there was for the rain. 7) Elijah, no longer a young man, outran King Ahab's royal steeds to Jezreel, a distance of about 16 miles (verse 46). Take heart, joggers. In I Kings 19, Jezebel enters as the primary protagonist in the story, threatening Elijah with death (verse 2). Pay careful attention, now: "And when he [Elijah] saw that, he arose and ran for his life" (verse 3). Elijah feared for his very life! This is, in part, what God inspired James to excerpt for our encouragement — not to gloat over Elijah's weaknesses, but to show us we all are built alike and that God works through weak human instruments to show Himself mighty through us. God's strength is made perfect in our weakness (II Cor. 12:9). 8-9) Twice God supernaturally provided food for Elijah to eat, not to mention an angel to tell Elijah to eat it (I Kings 19:4-8). 10) Elijah "went in the strength of that food forty days and forty nights as far as Horeb [Sinai], the mountain of God" (verse 8). Incredible! Bible students know that the number 40 in Scripture signifies trial or testing. Elijah was about to receive his final exam from the Eternal, likely precipitated by his flight from Jezebel. Running from Jezebel (the woman who would be king!) exposed his momentary lack of faith in God, which evidently resulted from Elijah's growing idea of self-importance (compare I Kings 19:10 with Deuteronomy 8:10-20). Elijah's vision blurred. He forgot who performed these marvelous miracles through him. That's why Elijah presumptuously avoided God's incisive questions that' followed. God "said to him, 'What are you doing here, Elijah?' So, he said, 'I have been very zealous for the Lord God of hosts; for the children of Israel have forsaken Your covenant, torn down Your altars, and killed Your prophets with the sword. I alone am left; and they seek to take my life'" (verses 9-10). God did not argue with Elijah, but instructed him to stand upon the mount. God intended to pass by while creating cataclysmic phenomena, hoping, in His mercy, to clear Elijah's accumulating carnal cobwebs (verses 11-12). For God loved Elijah. These phenomena — a strong wind, an earthquake and a fire — constituted miracles 11, 12 and 13. God then repeated His question, asking Elijah why he was there. Perhaps because of Elijah's embarrassment, or maybe because he was still momentarily blinded by his own importance, Elijah answered God exactly as before (verses 13-14). Again, God did not argue with Elijah. He simply directed Elijah to go anoint Hazael as the king of Syria, Jehu as the king of Israel and Elisha as prophet in his own office. These three would finish the commission God effectively started through Elijah (verses 15- 17). This likely was a mighty test for Elijah to perform. 14) This miracle helps show God's thoroughness. All along, though Elijah didn't realize it, God left nothing to chance. God said, "Yet I have reserved seven thousand in Israel, all whose knees have not bowed to Baal, and every mouth that has not kissed him" (verse 18). God provided Himself these 7,000 to begin restoring His ways to Israel. The people would be protected by two heads of state, Hazael and Jehu, and the religious head, Elisha. Let us give a little more credit to our omniscient Sustainer. Please do not misunderstand: Elijah's faithful prayers were answered. The apostle lames highlights only two of Elijah's prayers. There were more. We've seen them. Why were they answered? For the same reasons yours will be answered. You, if you are a true Christian, obey God's will, as Elijah did (I John 5:14-15). Like Elijah, you keep God's commandments (I John 3:22). Obedience proves one's faith in God (Jas. 2:18). "But without faith it is impossible to please Him [God], for he who comes to God must believe that He is, and that He is a rewarder of those who diligently seek Him" (Heb. 11:6). Elijah believed in God. You can, too. Elijah prayed according to God's will. Your prayers will be answered if you will, also. Jesus instructed us to pray, "Your will be done on earth" (Matt. 6:10). James warns us to avoid asking "wrongly, to spend it on your passions" (Jas. 4:3, Revised Standard Version). And John writes of the godly confidence we may have "that if we ask anything according to His will, He hears us. And if we know that He hears us, whatever we ask, we know that we have the petitions that we have asked of Him" (I John 5:14-15). It follows that we should study God's Word to come to know God's will (II Tim. 2:15, Eph. 5:17). Elijah knew from God's Word that God's curse of drought would follow Israel's worship of false gods (Deut. 11:16-17). The same blessings and cursings apply in this end age. During the 31/2-year Great Tribulation, God's two witnesses will "have power to shut heaven, so that no rain falls in the days of their prophecy" (Rev. 11:3, 6). This end-time Work, of which you as a member or co-worker are part, functions in the "power of Elijah" (Mal. 4:5-6, Matt. 17:11). We today have the greatest commission in man's history. Yes, much greater than the original Elijah's commission! Mighty miracles are being done through this Work, using the mass media to warn modern Israel about her wayward ways and proclaim the glorious good news that a repaired, peaceful and prosperous world tomorrow is imminent (Matt. 28:18-20, Ezek. 33:7-16, Isa. 58:1). The world is being warned! Lives are being changed! God has provided the open doors of the media to this Philadelphia era of God's true Church to get the job done (Rev. 3:7-8). 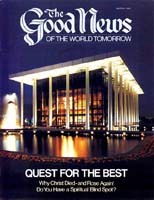 God has raised up this era through Pastor General Herbert W. Armstrong, and uses him as head spokesman. We are called to support him and this end-time Work of a third and final Elijah! So recognize your high calling and approach God with both humility and boldness (Isa. 66:2, Heb. 4:16). Design your prayers to serve others (Eph. 6:18-19). Know that your fellowship is with God, and that your fellowship with God is fostered and promoted through prayer (I John 1:3, Ps. 55:17). Recall, too, that Jesus exhorts us, "... when you pray..." and not, "... if you pray..." (Matt. 6:5-13). Israel — our people today — complaining to God because it alleges that it "fasts" (verse 3). Israel does so "to make your voice heard on high" (verse 4). That's an attempt to compel God to do Israel's will — Israel wants to continue rejecting God's laws and yet appear to be righteous and acceptable to God. We must not be of that number. We know better. God directs that our motive should be to draw closer to Him, to free ourselves of inhibiting selfish pursuits (verses 6-7). If we do, this will be the result: "Then you shall call, and the Lord will answer; you shall cry, and He will say, 'Here I am'" (verse 9). God promises that this kind of prayer will result in blessings for you now and will help you qualify for the wonderful world tomorrow (verses 11-12). What a glorious guarantee! So take heart when you read the inspired yet abbreviated example of Elijah's prayer in James 5:16-18. The fervent prayer of a righteous man will, indeed, avail much!